With Free Burma Rangers team of almost two dozen, the Burma Vision training was presented to twelve bright medics from the southern Karen State at Medic Ilya's Clinic in Leh Tong Ku. Many patients were screened, examined and over 150 glasses were dispensed. 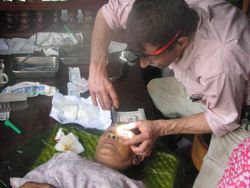 Two serious eyelid surgical cases were performed in Bueng Kung near the school, hostel and Pastor Samuel's church.